Have you ever dreamed of what it might be like to go camping with Samuel L. Jackson? Of course you have. Well, thanks to the upcoming thriller Big Game, we will all have the chance to experience this dream vicariously. Jackson stars as the President of the United States who is forced into an unexpected trek through the wilderness when an attack on Air Force One forces him to abandon it. His safety pod crashes near the campsite of a 13-year-old boy named Oskari, who is on a lone camping trip to prove his manhood. Together the pair try to make their way to the safety of civilization, while attempting to avoid the terrorists who are still seeking POTUS's demise. Variety has shared a first look at Big Game, which is posted above, along with news on who will co-star. The photograph up top shows Jackson and Onni Tommila, who plays the President's unexpected sidekick in this adventure. Joining them in a cast that already includes Jim Broadbent (Le Week-End), Ray Stevenson (G.I. Joe: Retaliation), and German actor Mehmet Kurtulus (Short Sharp Shock) are Felicity Huffman (Desperate Housewives), Victor Garber (Argo), and Ted Levine (American Gangster). Garber will play the Vice President under Jackson. Huffman is set for the role of the director of the CIA, and Levine will portay one General Underwood. Broadbent, Stevenson, and Kurtulus's roles are at present unknown. If you somehow missed out on this deeply creepy Christmas story, you can watch it now on Netflix Instant. Having seen it, I still don't really know what to expect from Big Game. On one hand I'd anticipate the kind of bonkers storytelling and gruesome action I saw in Helander's first film. But with such noteworthy actors on board, he might be striving for something more mainstream and less insane. On Big Game, Helander reunites with Rare Exports cinematographer Mika Orasmaa, who also shot the outlandish Nazis in space action-comedy Iron Sky. And on board to create the film's special effects is Scanline, the company who helped create The Avengers and Iron Man 3. These crew choices just add to the intrigue of Big Game might have in store. 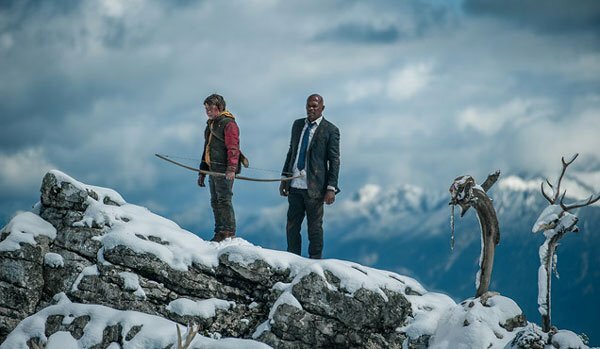 Big Game's eight-week shoot in Bavaria, Germany is drawing to a close. There's no word yet on when it might open theatrically.